Recently I was in Chicago to meet a friend and also spent some time walking around and exploring the places. 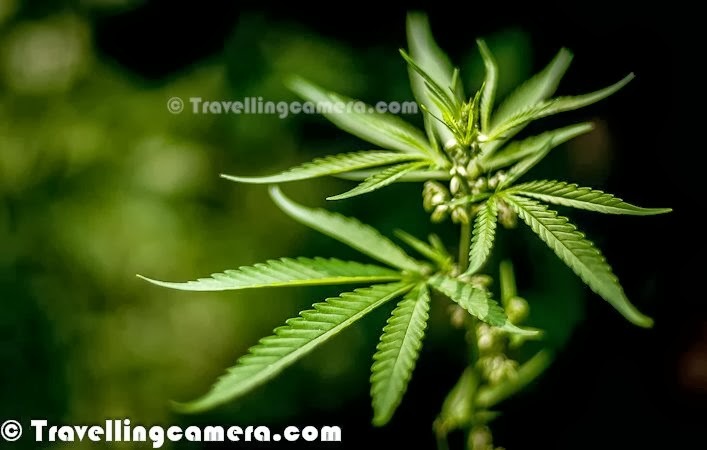 Winter is not that great time to visit Chicago because of it's chilling weather but certainly the city has it's own character in winters as well. During my 3 days visit, the place which I liked the most of Chicagi Cultural Center and probably because I spent the most time here during my trip. 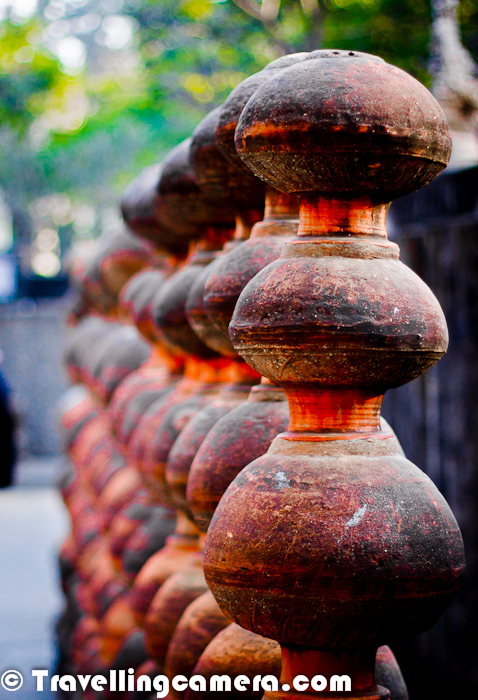 The reason can be other way round that I spent more time here because I found it interesting :). 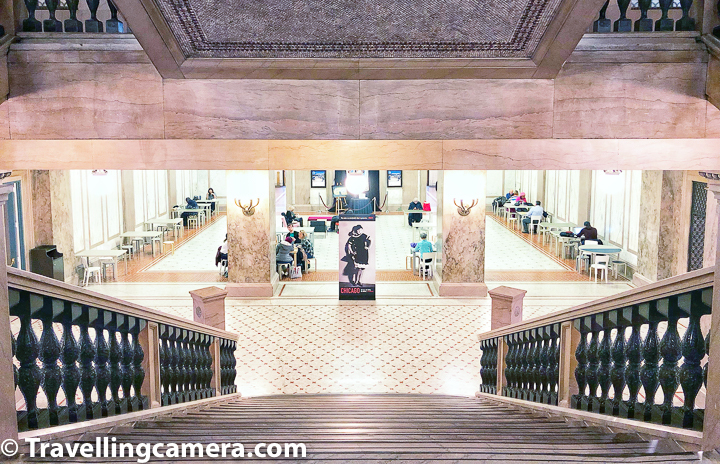 This Photo Journey takes you through Chicago Cultural Center, share it's beautiful corners, what to expect at Chicago Cultural Center, how to make best use if your visit to Chicago Cultural Center and a lot more. 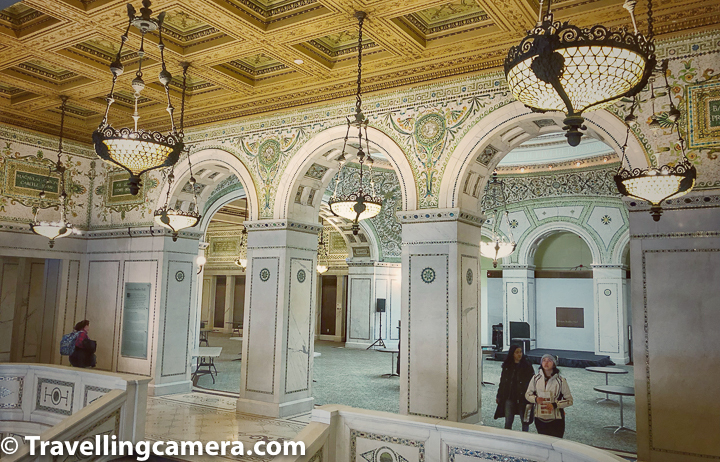 Entry fees for Chicago Cultural Center? Entry to Chicago Cultural Center is FREE, so you don't need to queue up in any line to buy tickets and can still enjoy dozens of art shows here. 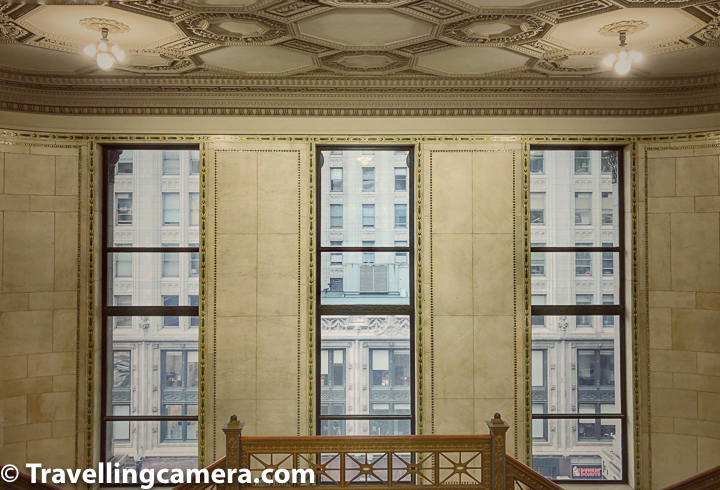 Apart from Art shows, one can enjoy beautiful architecture of Chicago Cultural Center. 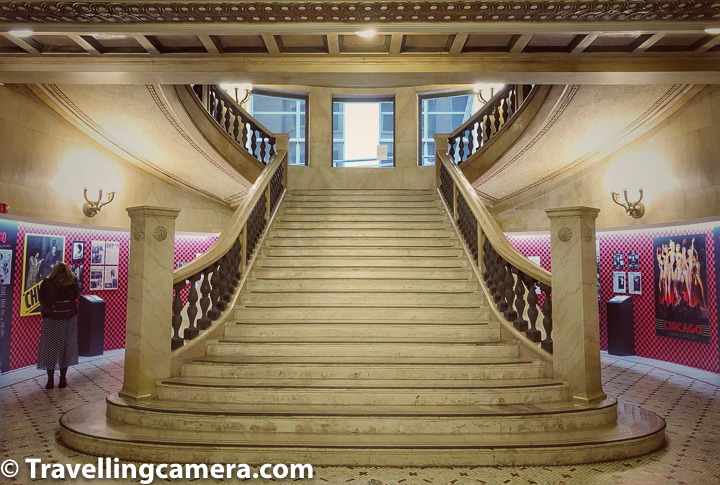 The curving stairway in above photograph is faced with Knoxville pink marble and features mosaics and ornate bronze balusters. 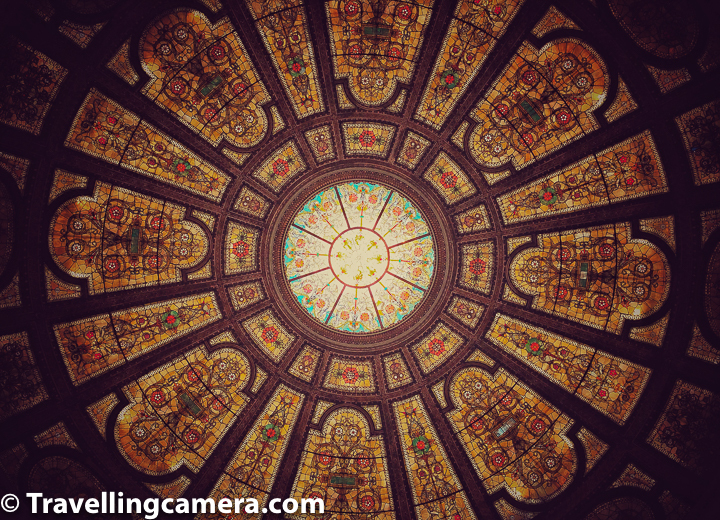 Tiffany glass dome of Chicago Cultural Center is very popular and supposedly the largest one in the world. 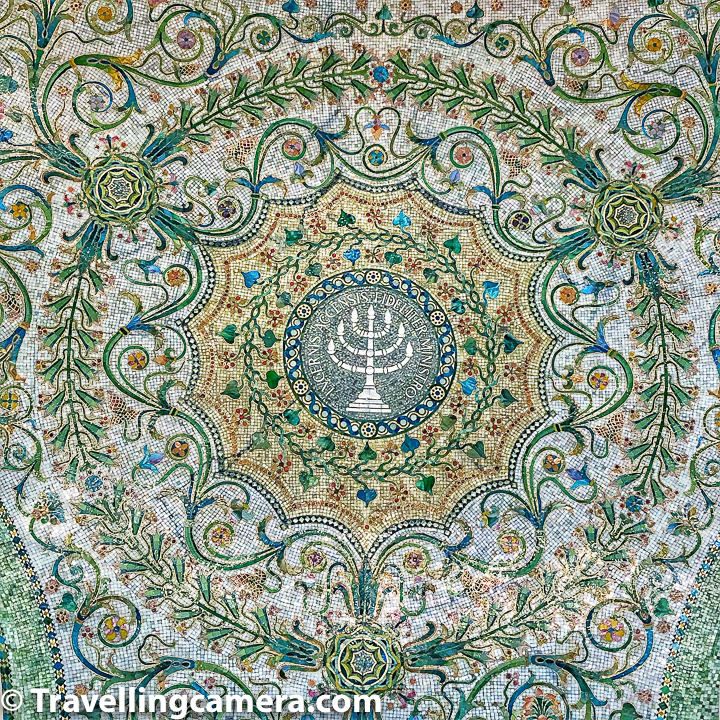 Above photograph shows ornately patterned room of curving white Carrara marble, capped with an 38 feet Tiffany glass dome. The Cultural Center states this to be the largest Tiffany dome in the world. Chicago Cultural Center building was designed by Boston architectural for the city's central library and Grand Army of the Republic (GAR) meeting hall and memorial in 1892. 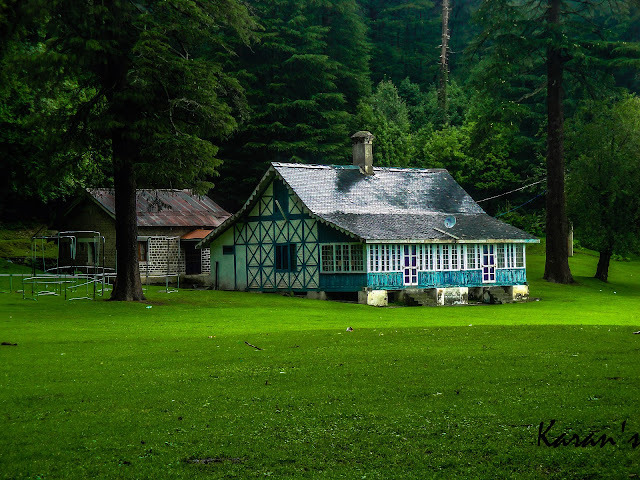 The place where it's located was donated by the GAR and the building was completed in 1897 at a cost of nearly $2 million. 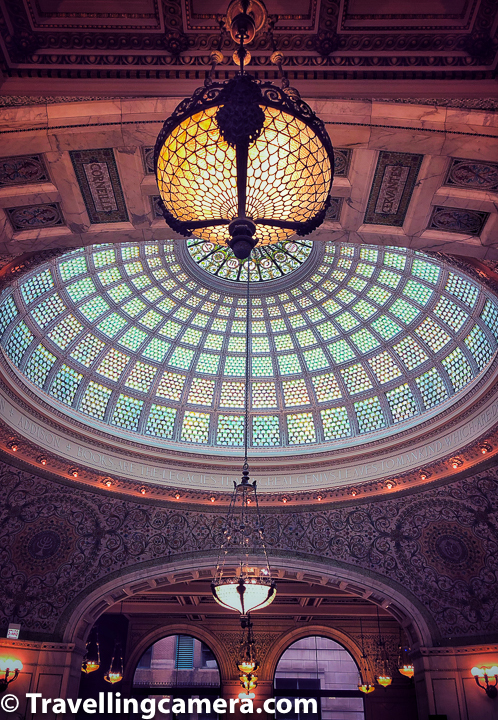 Chicago Cultural Center is capped with two stained-glass domes, set symmetrically atop the two wings of the building. 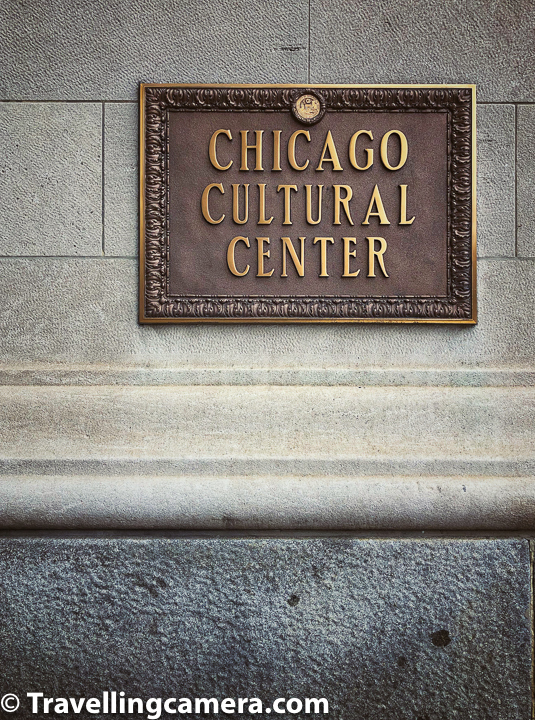 The Chicago Cultural Center is located in the Loop, across Michigan Avenue from Millennium Park. Originally the central library building, it was converted in 1977 to an arts and culture center at the instigation of Commissioner of Cultural Affairs Lois Weisberg. Above photograph shows a common seating area on the ground floor where you can grab a book or drink to sit around. It's a cozy place in chilling winters of Chicago city. The staircase is made of white Carrara marble, set with medallions of green marble from Connemara, Ireland, and intricate mosaics of Favrile glass, stone, and mother of pearl. 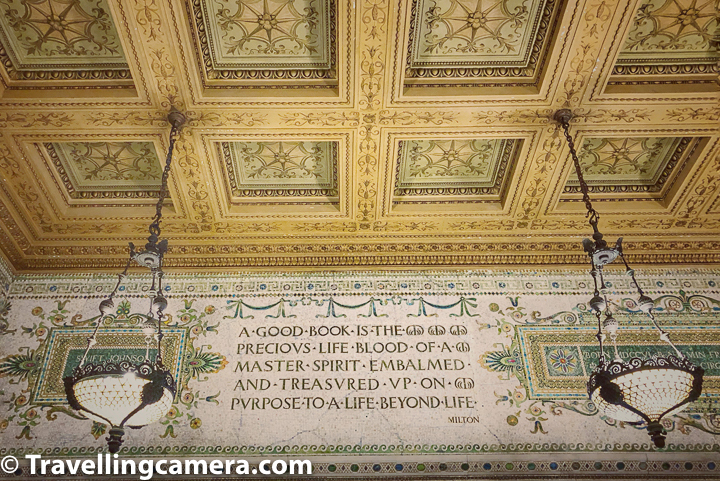 There are different entries to the Chicago Cultural Center. 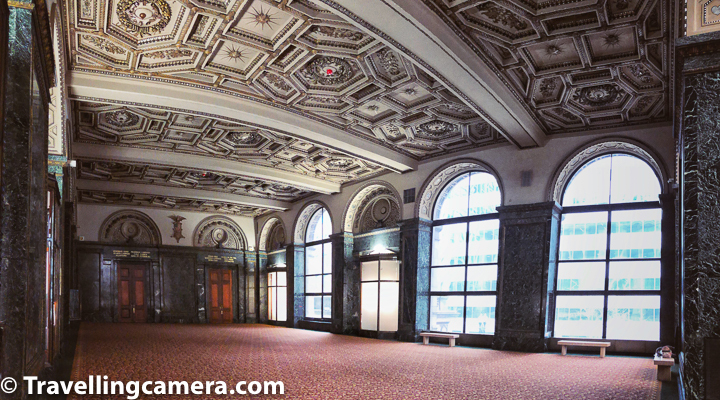 The one on Randolph Street has doric columns, mahogany doors, and entry hall with coffered ceiling and walls of green-veined Vermont marble. 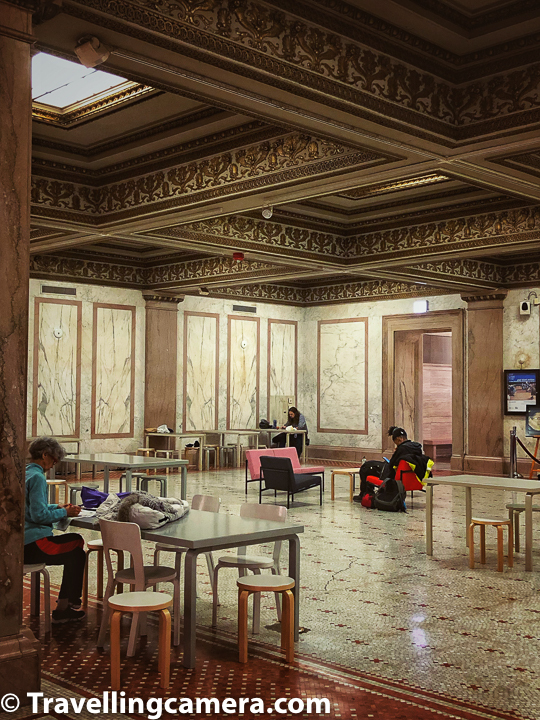 As the nation's first free municipal cultural center, the Chicago Cultural Center is one of the city's most popular attractions and is considered one of the most comprehensive arts showcases in the United States. 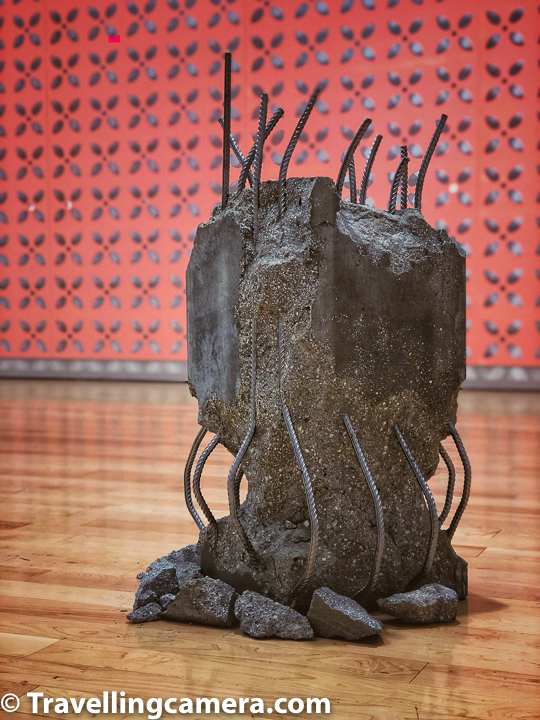 Each year, the Chicago Cultural Center features more than 1,000 programs and exhibitions covering a wide range of the performing, visual and literary arts. Preston Bradley Hall is most beautiful place in the building and must visit. If you have only 10 minutes to explore this building, make sure you visit Preston Bradley Hall if nothing else here. There is another entrance to Chicago Cultural Center. 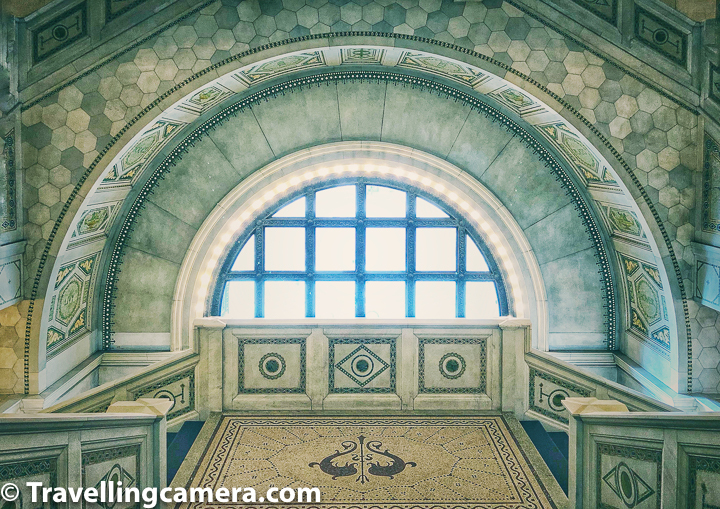 Washington Street entrance has arched portal, bronze-framed doors, and a 3-story, vaulted lobby with walls of white Carrara marble and mosaics. 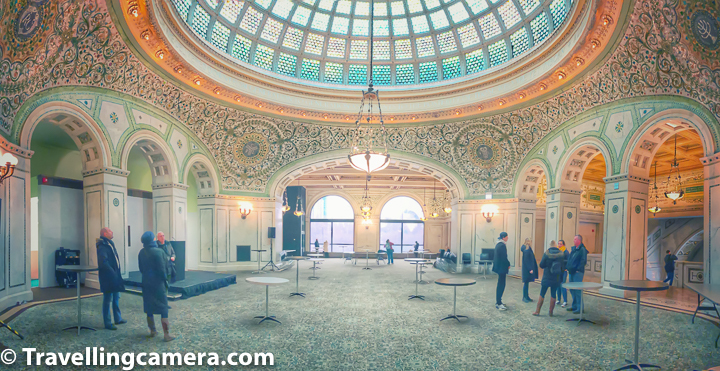 I thoroughly enjoyed the visit to Chicago Cultural Center and highly recommend this place. As a bonus tip, everyday at 1pm there is a guided tour of the building and can be a better way to explore this place, it's architecture, history and currently going on shows.